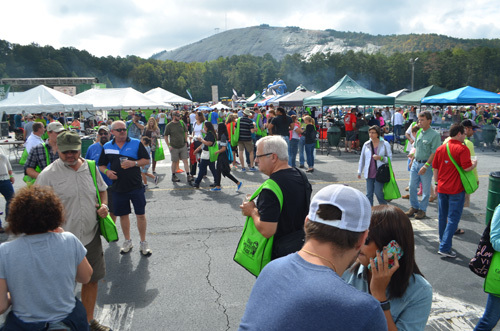 This past weekend, our BBQ team went to Eggtoberfest in Stone Mountain, Georgia. 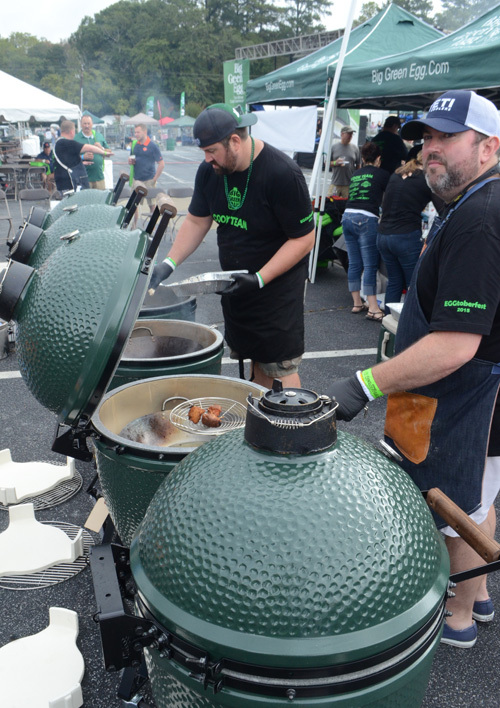 We weren't cooking at the event, we were just taking it all in since this was the first Eggtoberfest for most of our team. It is a BBQ/grilling exhibition, not so much a competition. 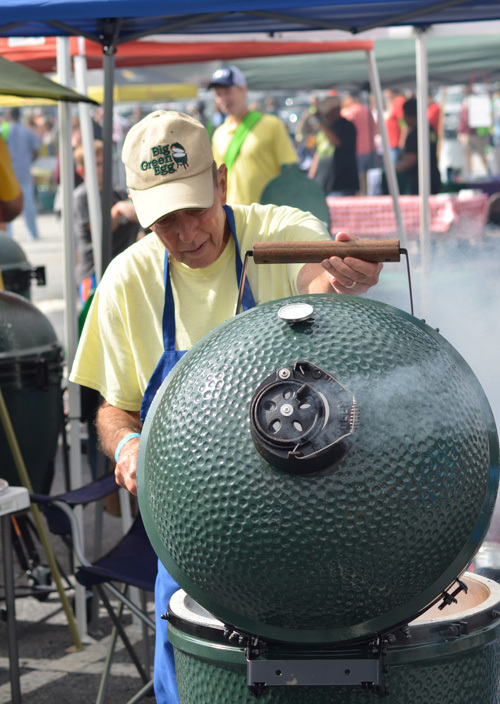 Four hundred people cooking on over 200 Big Green Eggs for 4,000 people - quite the spectacle. 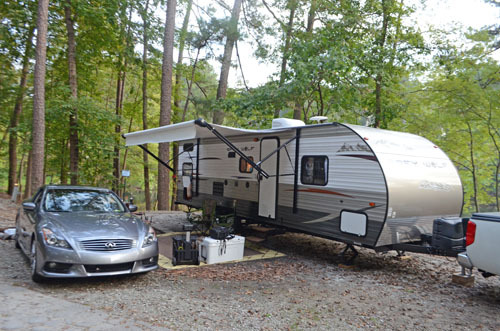 Since the event was held at Stone Mountain, we stayed in the lakeside campground nestled in the tall pines. The five of us stayed in a RV rented from RV Valet which is a very cool service. 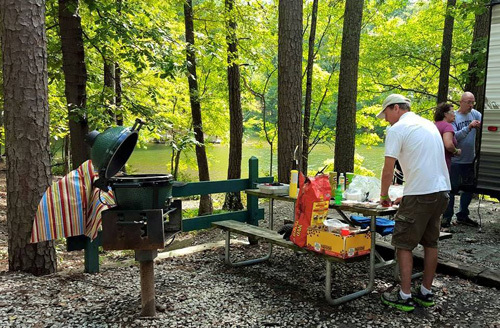 They secure your camp site and set you up with a fully furnished RV onsite. All you have to do is show up and "move in". They even set up the outdoor area for us. It was the easiest camping experience I have ever had. The RV was ready for us including bed linens, cable TV, outdoor settings, and a kitchen with all of the essential equipment. Thad and his team were hospitable and made sure we had everything that we needed. 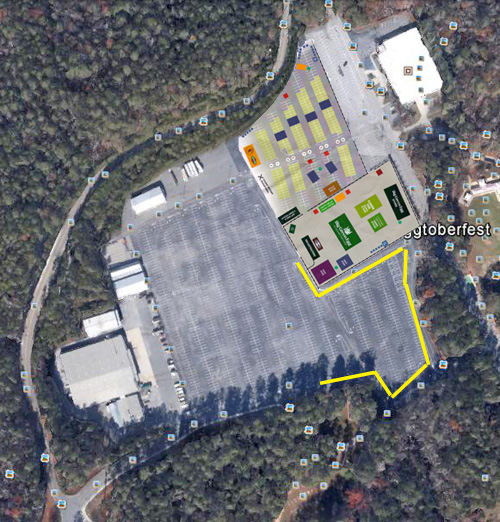 I highly recommend RV Valet if you are ever planning on camping at Stone Mountain. We had the 28' Grey Wolf unit. Well worth the money when the rains came in at 2am. Our site was right on the water. Still enjoying my Father's Day present...it's bear proof! Just in case bears like beer. 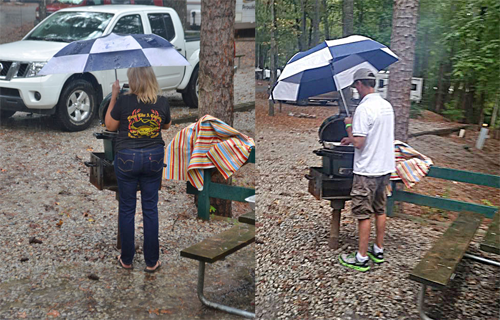 Campsite and park grills are notoriously bad. When I got there, my sister had "slightly modified" ours with her Mini-Max to make it a "little" better. ...rain. Well crap. Like sister, like brother. 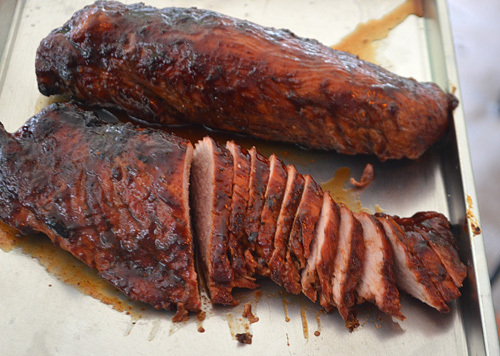 Rhonda's cherry chipotle pork tenderloins for sliders. 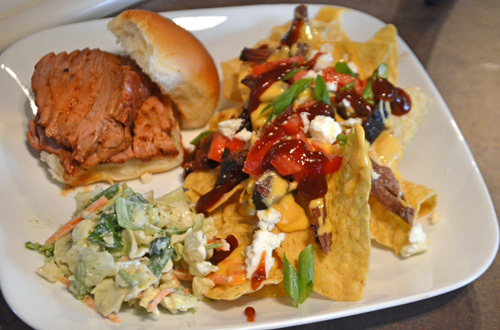 Cherry chipotle pork tenderloin sliders, smoked brisket nachos, and Asian chopped slaw. Beats the heck out of hot dogs for camp food. We were also there with a larger group of people but we have a very strict "what happens here, stays here" policy, so no pics from the evenings. Suffice it to say that we had a couple of good nights, ridiculing each other, laughing, and telling lies. 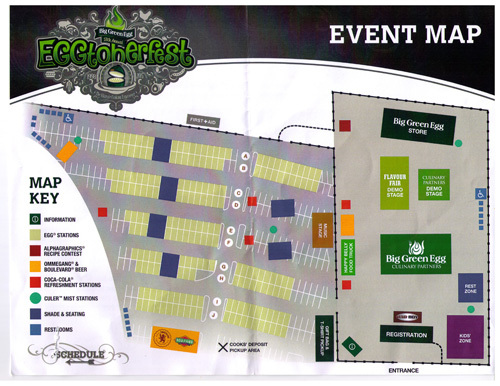 Smaller Eggfests happen across the country throughout the year but this is THE Eggtoberfest held by the corporation. 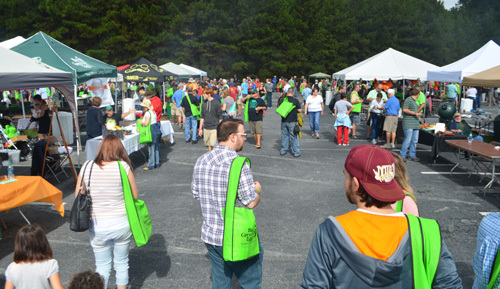 The event was on Saturday morning from 10am to 4pm. It started off on a bad note this year. 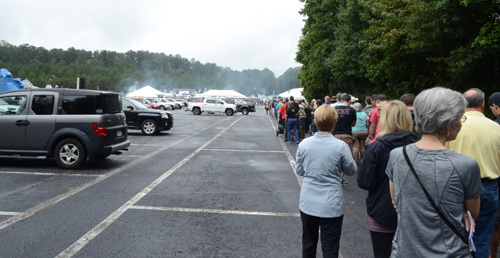 The line to get in was about 1,100 feet long and took right at an hour to get into the gates. By then, a lot of the teams had already served their first courses. 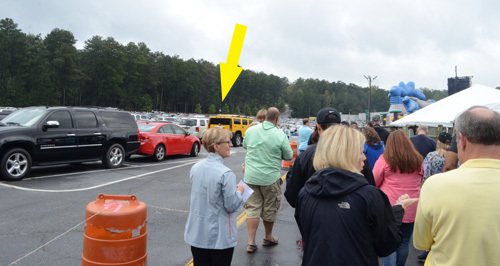 I haven't been to Eggtoberfest since 2010 but there was never a line like that back then. About halfway through the line at this point. 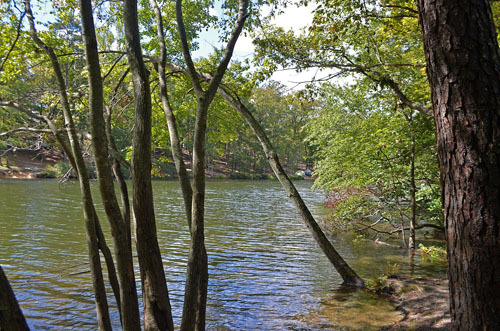 The yellow arrow is pointing to the end of the line way in the distance by the trees. I get that this was 4,000 people but Memphis in May has 100,000 people and it doesn't have lines this long. Long lines will turn people away from coming back so I hope they address it next year. The bottleneck was the check in process where they marked you off by name, after finding you on a list several pages long. The tickets already have QR codes printed right on them for instant validation. BGE needs to take advantage of that and scan tickets for check in - it's WAY faster and would take fewer people to handle that process. 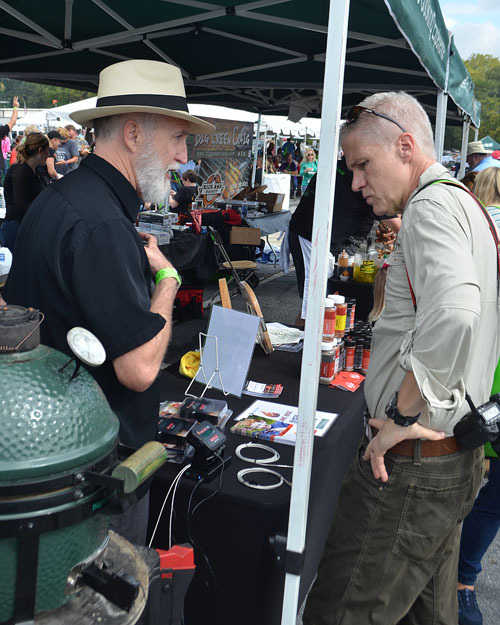 One of the great things about these events is fianlly meeting fellow kamado enthusiasts that you know from online, like my cyber buddy Tim Shelburn (on the left). 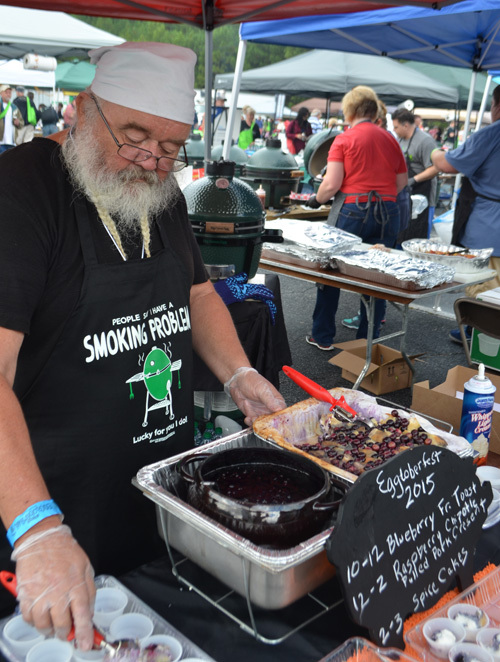 Here he was deep frying smoked pork belly. 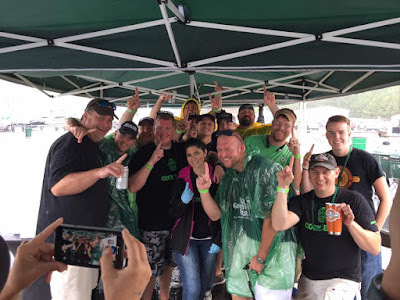 Blake Carson was also with Team Big Green Craig using a pair of his Carson Rodizio rigs that work on kamado grills, gas grills, or other charcoal grills. 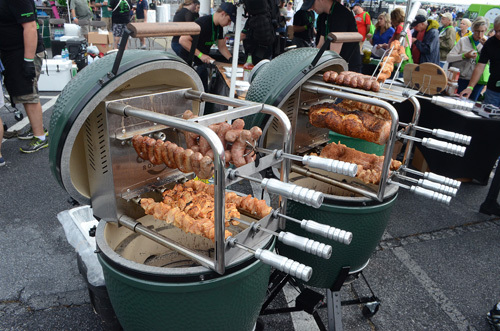 These are Brazilian style rotisseries like the churrascaria restaurants like Fogo de Chao use. Pricey but very cool. Marcia staying on top of things and keeping the food coming. Clayton serving up a delicious blueberry French toast with whipped cream. 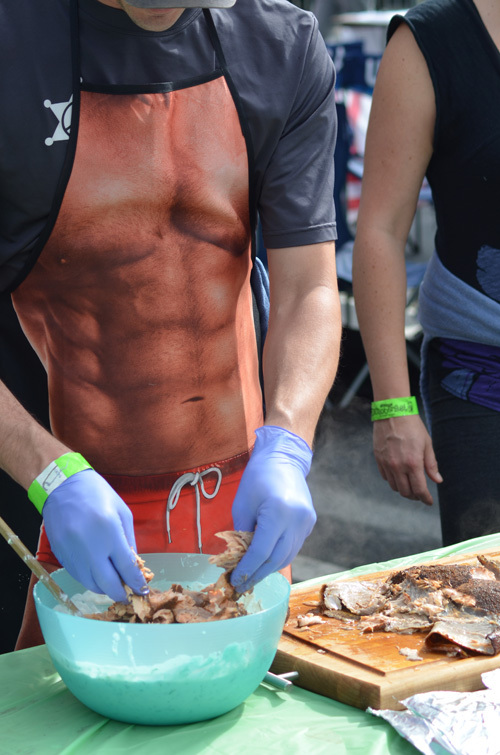 I love that teams do creative things like this instead of the typical grilling fare. 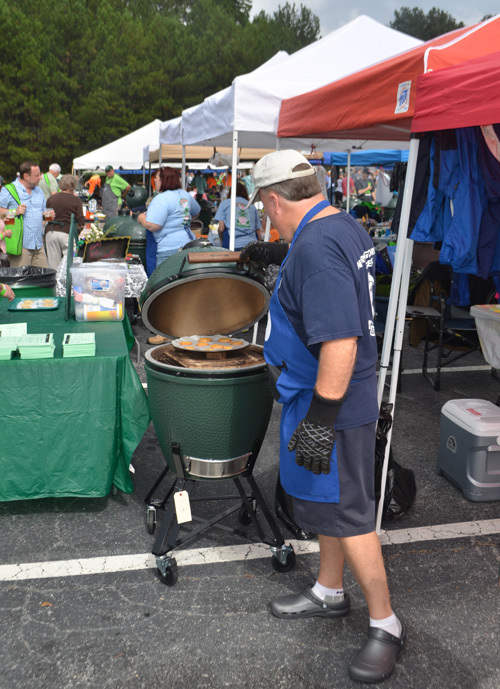 Cooks were busy trying to keep the throngs fed throughout the event. These teams are doing this for the love of grilling/BBQ. They aren't paid to do the event and they pay for the food they serve. 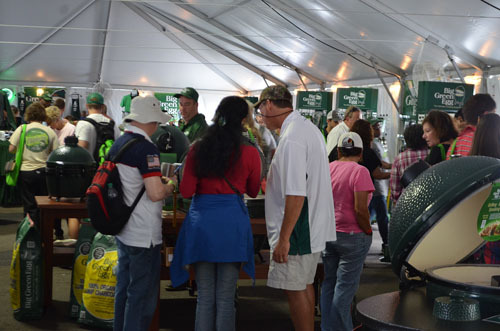 When a team booth starts serving food, the lines form quickly and the food disappears in minutes. Almost like how piranhas can strip a cow carcass clean in minutes. Salmon gives you rock hard abs, who knew? Obligatory Thermapen sighting. 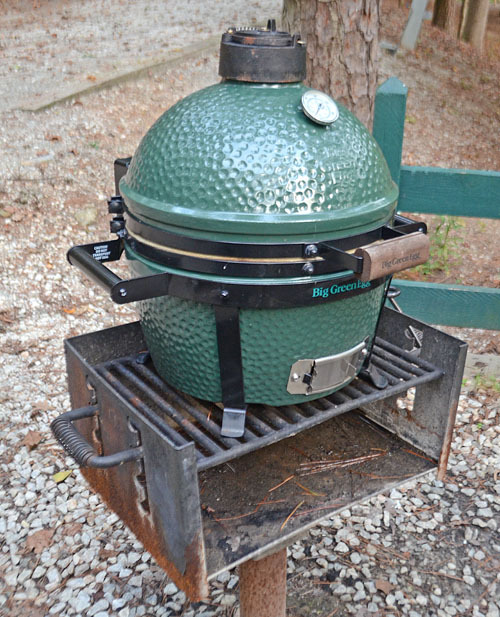 There is a reason you see these at every high level BBQ event - they are best in class in the digital thermometer category. 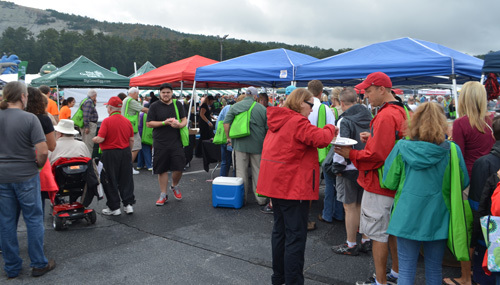 Two common sightings at Eggtoberfest - food lines (moved quickly) and the bright green gift bags. 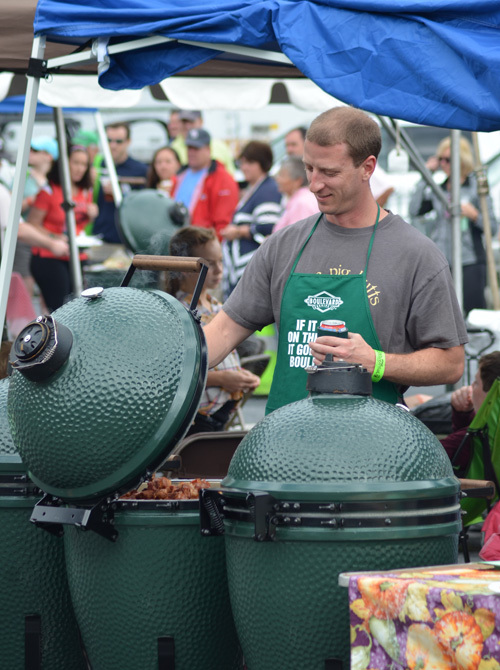 One difference between Eggtoberfest and the regional dealer Eggfests is the number of Eggs per team. At regional ones, teams might only have 1 to 3 Eggs. It strikes me that I have "known" some of these people from the old egg forum for 7 years now. Sliders are a crowd pleaser but require a lot of hands on prep. 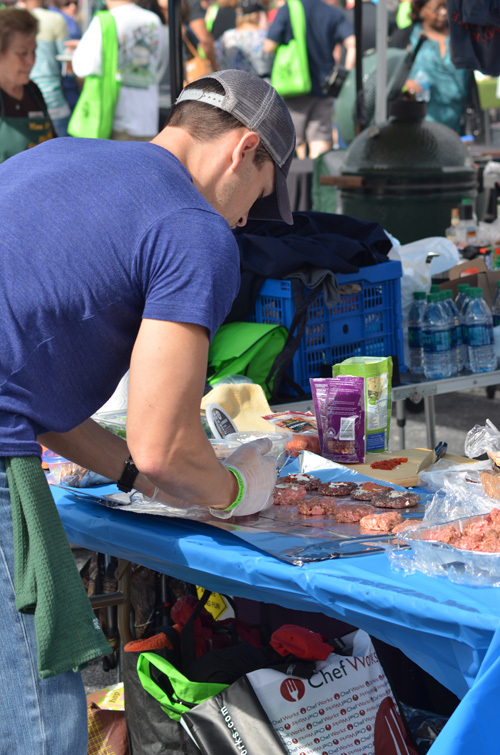 Teams make strategic menu decisions where prep time and turnaround time are just as important as the final product because there is no time to waste. Then again, many hands make light work. 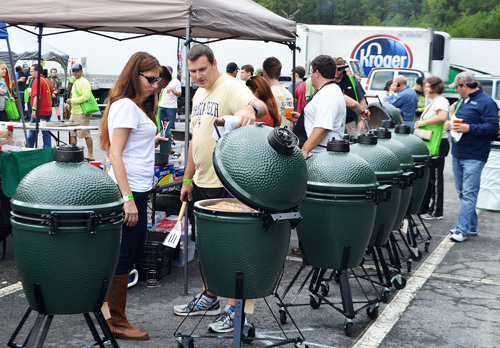 The North Georgia Eggers always represent well at Eggfests. This year their theme was cookies and they made some great ones. 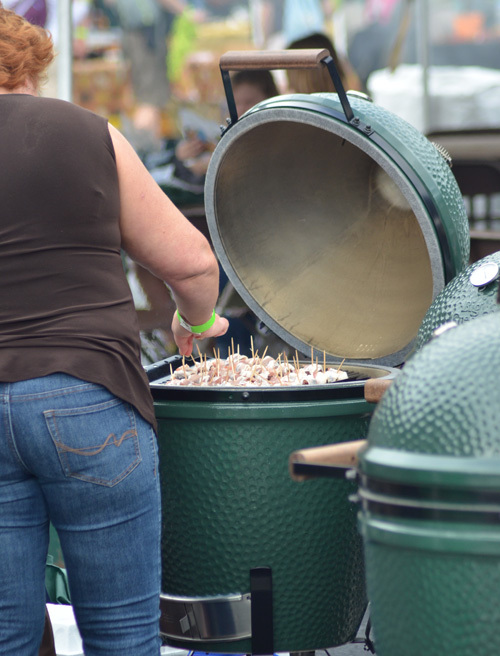 Here long time Egger, Kim Youngblood, checks a batch that were delicious. There were rows and rows of teams. Michael Collins of Flame Boss takes time to talk with an attendee about the Flame Boss 200 . This is my favorite electronic controller and it is the only one that I have trusted to use in BBQ competitions. 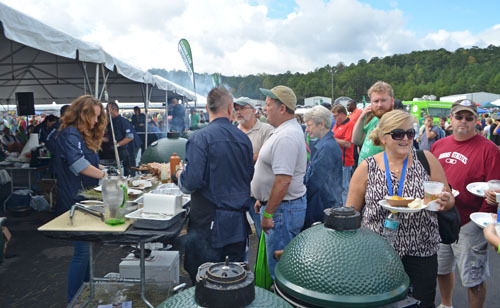 In addition to the Eggers, corporate had a big tent of Culinary Partners serving food as well. 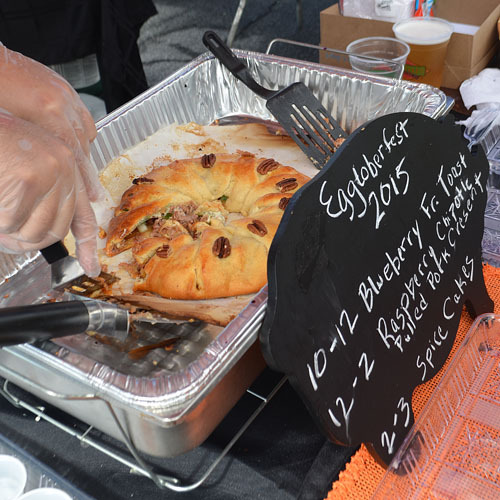 Raspberry chipotle pulled pork crescent from Marcia S and company. This is the kind of creativity that I like. 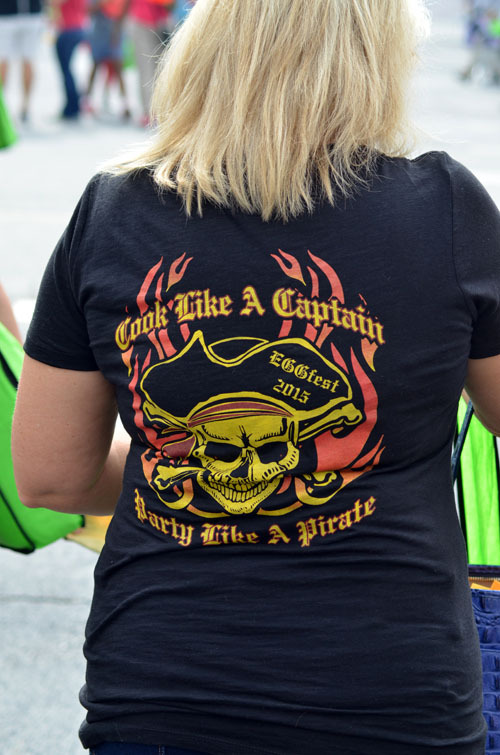 My favorite team shirt of the weekend - "Cook like a captain - party like a pirate". 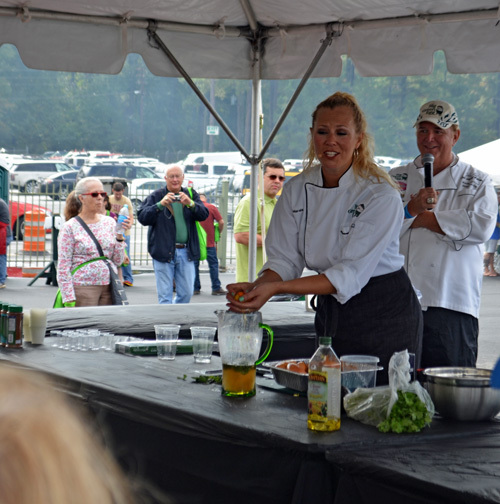 There were culinary experts on hand sharing their advice and recipes at two demo stages. 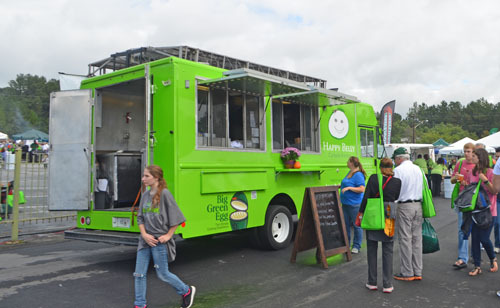 Happy Belly - a Big Green Egg powered food truck. Nice idea, I've been working on something similar for Knoxville. 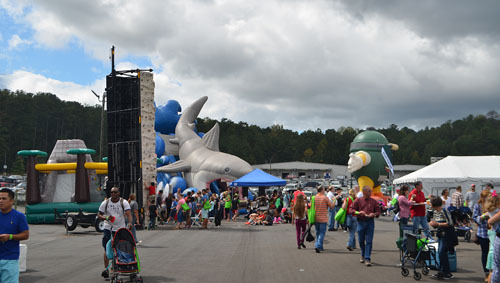 Climbing rock tower, bounce house, and inflatable shark slide for the kids and kids at heart. 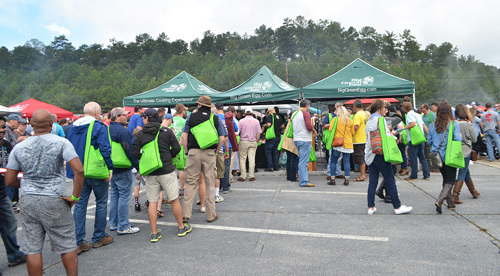 The BGE Store store was constantly full of attendees checking out the latest gear and stocking up on supplies. 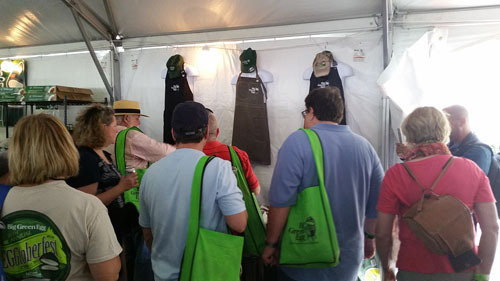 The new BGE branded aprons by Chef Works garnered a lot of attention from the crowds. 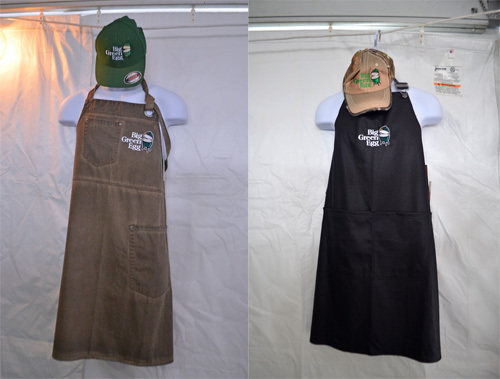 These full length bib aprons are a one time run (as of now) to kick off Chef Works new endeavor into consumer goods. 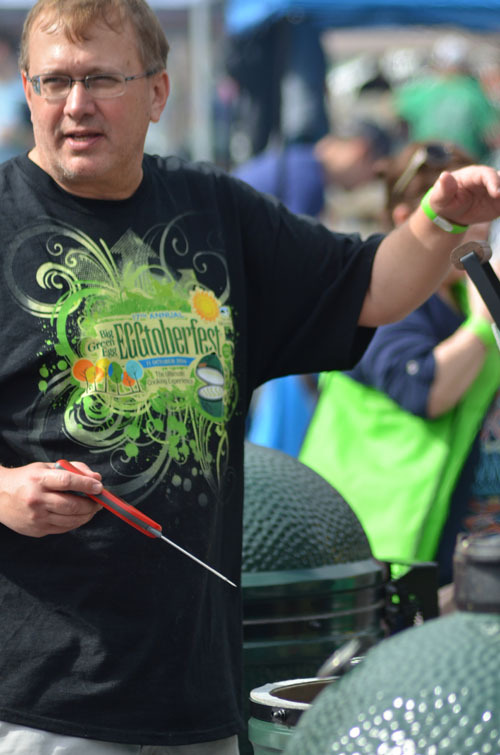 So Chef Works was at Eggtoberfest to announce their expansion. 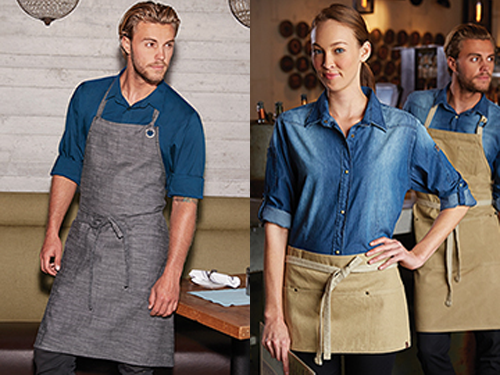 They are a global leader in culinary apparel for the hospitality and restaurant industries. Now they are expanding their reach with to serve the back yard warriors and home chefs like me and you. It's the same gear that you see professionals wear. It is just as rugged, stylish, and most importantly - functional! This apparel is constructed with heavy duty materials to handle repeated use and washing. I got to see some of their line up at Taste of Atlanta last year and I was impressed, especially with their Urban Collection. 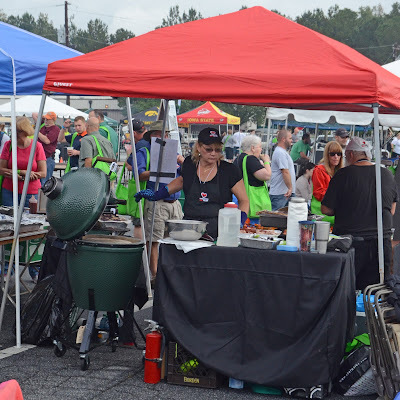 A lot of that line would be great for outfitting your BBQ team to look first class. To help get the word out about their new consumer retail program, Chef Works has put together the following prize package for a giveaway here on Nibble Me This. 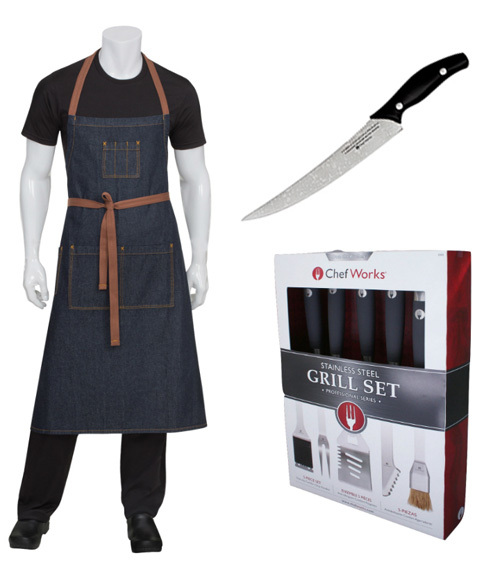 It includes a Chef Works Memphis apron ($34.99), a Chef Works 5 piece Professional Grill Set ($75), and a super sweet 9" slicing knife from legendary knife maker, Ken Onion ($190). That is a top shelf prize package, my friends! Not to scale....but how kicking would that knife be if it was? Giveaway entry period begins as soon as this is posted and ends October 25, 2015 at 11:59pm. Drawing will be held October 26, 2015 at noon (All times are Eastern Time zone). Winner will be announced in an update to this post. Comments and Tweets will be numbered by order received and I'll use random.org to generate a random number for the winner. Chef Works is just sponsoring this prize. I am the final judge regarding any discrepancies, interpretations, grievances, etc about this drawing. Adam I sent you a message through Google+ for your mailing address. [FTC Standard Disclaimer] We have no affiliation with RV Valet and paid full price for our stay. 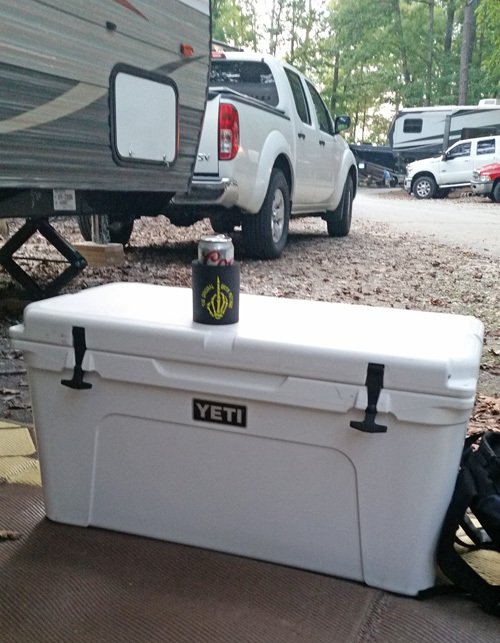 We received no compensation for this post from Yeti, BGE, Carson Rodizio, Thermoworks, Chef Works, or Flame Boss.